Definition: Frostbite is an injury caused by freezing of the skin and underlying tissues. In extreme cases, muscle, nerves, and blood vessels may also freeze. It is most common on the fingers, toes, nose, ears, cheeks, and chin. Exposed skin in cold, windy weather is most vulnerable to frostbite. But frostbite can occur on skin covered by gloves or other clothing. The initial symptom is typically numbness. This may be followed by clumsiness with a white or bluish color to the skin. Swelling or blistering may occur following treatment. The hands, feet, and face are most commonly affected. Complications may include hypothermia or compartment syndrome. Frostbite also occurs when our skin directly contacts very cold surfaces. This type of exposure may immediately freeze the skin that touches the frozen surface. There are different degrees of frostbite. In superficial frostbite, the skin can recover fully with prompt treatment. However, if frostbite is deep, tissue damage can be permanent and tissue loss can occur. The most important way of preventing frostbite is to get out of the cold. If people are exposed to the cold, make sure that they have adequate protective clothing. Causes, Sign, and Symptom of Frostbite: Frostbite occurs when skin and underlying tissues freeze. The most common cause of frostbite is exposure to cold-weather conditions. But it can also be caused by direct contact with ice, frozen metal or very cold liquids. In the second, the damaged lining of the blood vessels is the main culprit. As blood flow returns to the extremities upon rewarming, it finds that the blood vessels themselves are injured, also by the cold. This injury is the primary determinant of the amount of tissue damage that occurs in the end. The major risk factor for frostbite is exposure to cold through geography, occupation and/or recreation. Inadequate clothing and shelter are major risk factors. Physical, behavioral, and environmental factors can all contribute to the development of frostbite. Immobility and physical stress (such as malnutrition or dehydration) are also risk factors. Frostbite is often preceded by frostnip. The symptoms of frostbite progress with prolonged exposure to cold. 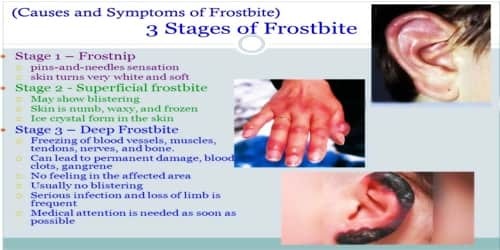 Historically, frostbite has been classified by degrees according to skin and sensation changes, similar to burn classifications. Frostbite is most common on the fingers, toes, nose, ears, cheeks, and chin. Because of skin numbness, people may not realize they have frostbite until someone else points it out. Diagnosis and Treatment of Frostbite: Frostbite is usually diagnosed by the typical symptoms in someone who has been exposed to extreme, cold weather. Frostbite can happen very quickly so people need to be aware of the symptoms and signs. A doctor may conduct tests, such as an X-ray, a bone scan or an MRI. These can help him or she determines the severity of their frostbite and check whether bone or muscle is damaged. 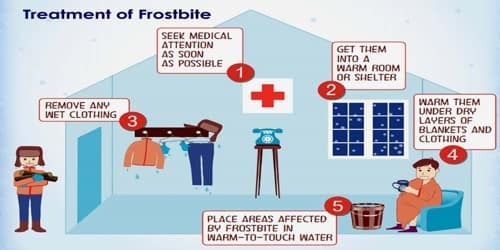 For all another frostbite, after appropriate first aid and assessment for hypothermia, treatment may involve rewarming, medications, wound care, surgery, and various therapies, depending on the severity of our injury. Removal of damaged tissue (debridement). Whirlpool therapy or physical therapy. In the most extreme cases, bone, muscle, and nerves experience damage. Amputation surgery may be necessary. Doctors may try to repair tissues with drugs called thrombolytics, which they’ll deliver intravenously (through a vein). These drugs can cause severe bleeding and are usually the last resort to avoid amputation. Exercise can get the blood flowing and help people stay warm, but don’t do it to the point of exhaustion.